Get your free quote on chimney chase covers from Early Times Home Solutions. If you have a prefabricated, manufactured or factory built chimney, then you have a chimney chase cover. It’s the part of your chimney that covers the top to prevent moisture from entering. Chimney chase covers are not found on masonry chimneys. Over time, chimney chase covers can become worn out and rusted, creating an eye sore on your home and the potential for damages to occur. It’s important that your chimney chase cover is in good condition to maintain the life and functionality of your chimney. Also called chase tops, chimney chase covers are a fitted metal covering that provide protection against precipitation. There are many materials that chimney covers can be made from. Each material has its own benefits and here at Early Times, we offer many styles to help you match your chimney. Copper chase covers are the cream of the crop. Copper is resistant to rust and will certainly boost your home’s curb appeal. Copper chase covers are the most expensive option, but they certainly back up that price with excellent durability and beauty. 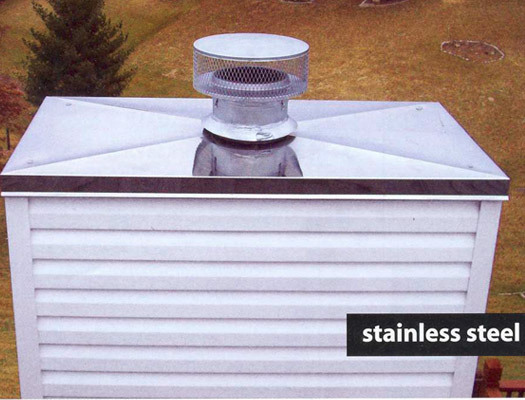 Stainless steel chimney chase covers are a very popular option because of their strength and ability to resist rust. Stainless steel covers are deemed the most sensible choice because they look good and last virtually forever. One of the biggest advantages of aluminum chase covers is that they come in a variety of colors to match your home. Aluminum will not rust when exposed to moisture. However, it’s not as strong as its steel and copper counterparts. Of all chimney chase cover materials, galvanized steel is the least expensive option. However, galvanized steel will rust over time and need to be replaced. 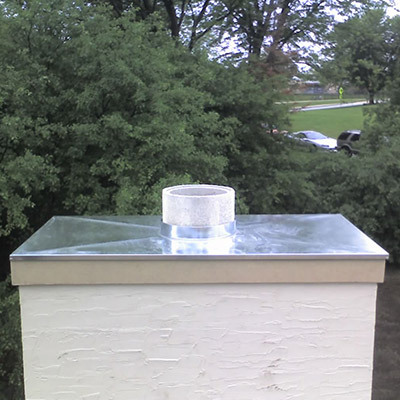 Installing a galvanized chimney chase cover is a sensible option for short term solutions. If you notice any rust stains on your chase cover, you should consider replacing it immediately. It’s only a matter of time before water starts to leak through into your chimney. Water damage is every homeowner’s nightmare and can cost an extreme amount of money to repair. Catching any flaws early on is imperative to your chimney’s structure. If your chase cover is rusted, it’s probably an old sheet of galvanized metal. When replacing your chase cover for the long-run, you should stick with copper, stainless steel or aluminum. Another feature to look for in a chase cover is cross breaks. Cross breaks are what create an “x” which prohibits water from building up on top of the chase cover. You’ll also want to make sure your chimney chase cover is installed correctly so that it works the way it should. For over 30 years, we’ve been providing Chicagoland with the best chimney services.We offer all kinds of chimney chase covers from aluminum to copper. Plus, you can rest assured knowing that your chase cover will be installed correctly and in a timely manner. Start your chimney chase cover replacement today with a free quote online.